Want to add a little wine touring excursion to your Venice holiday tours and Italy Vacation Packages? We have an enchanting full day tour to recommend that offers an itinerary with a little sampling of the best of the Veneto region. Avventure Bellissime’s popular Small Group Hill Towns of Veneto Trip is a breathtaking diversion into this region, one of 20 regions in the country, with an English-speaking driver-guide in a comfortable Mercedes minivan or similar make. Venice is the capital of the Veneto region, which has been an important presence culturally and economically for hundreds of years. This beautiful region in the Italian northeast is richly decorated in both natural and man-made treasures. The varied landscape ranges from the Venetian lagoon near the Adriatic Sea to rolling hills dotted with world-renowned vineyards and stretching up into the magnificent Dolomites mountain range. The hillside cities boast examples of fine architecture dating back to medieval times as well as inspired artwork that has in many cases long outlasted the artists behind the creations. The small group allows for a self-directed pace that isn’t hurried, giving everyone time to enjoy the sights and scenery and explore every destination. Our carefully selected licensed driver-guides are entertaining, knowledgeable, and personable. When you first catch a glimpse of this walled town you could easily imagine you have traveled back in time. This once fortified city now welcomes visitors to its fortified castle, museums, charming main town square, and network of quaint streets. Not only is this region known for the sparkling Prosecco wine, but also for a type of cherries so unique to this area they’ve been given a protected geographical indication (PGI). This is why you’ll shops stocked with cherry jams, preserves, liqueurs, and grappas. If you are lucky enough to travel here in September of an even year (like this year!) you might be able to catch one of the renowned and theatrical living chess game on the huge chess board in the main square. This lively game features costumed human chess pieces who enact a legendary match to determine the fate of a young maiden. The stunning view from this town out over the hillside is as relaxing as it is memorable. Nestled at the foothills of the Dolomites mountain range you will come to another walled town that is not a common destination for most Italian tours. This town, off the beaten path as they say, feels more like a destination for locals than it does for tourists. Experience the bustle of real Italian life as you wander through Bassano Del Grappa’s narrow, aged streets and stroll through the various town squares. Your experienced tour guide will be able to point out not only the still visible evidence of trenches and tunnels that date back to the First World War. There are many opportunities to stop and enjoy a sample of local cuisine in cafes and restaurants and countless museums to enjoy, including the Museo della Ceramica, dedicated to the rich history of Italian ceramics. Perhaps one of the most intriguing architectural sites here is a remarkable wooden bridge spanning the Brenta River called the Ponte Degli Alpini (but also known as the Ponte Vecchio) that dates to 1209. As you explore Bassano del Grappa there are countless spots to stop and enjoy the view of the countryside all around. There are many local specialties to enjoy as you peruse the shops and eateries, including locally made ceramics, porcini mushrooms, and of course a taste of the alcoholic beverage, a brandy known as grappa. The third town perched on the hillside you’ll visit on this tour of Veneto is the truly elegant Asolo. Here is a picturesque hamlet that has preserved its medieval architecture so well that is has been awarded the Bandiera Arancione seal from the prestigious Touring Club Italiano. When you venture into this charming small village it feels almost like an escape from modernity. What is interesting is that the name Asolo is derived from the Latin word asylum, which means refuge. For many creative minds, this peaceful little hilltop town has been a sanctuary. When the Queen of Cyprus Caterina Cornaro, who was Venetian-born, was exiled she chose to spend her days living in Asolo until her death in 1510. As befits a queen, she resided in a what is today known as Il Castello della Regina Cornaro with a full court of artists and great thinkers for amusement. This castle, with three of its four towers remaining, is believed to have been built in the 10th century. When you see the majestic clock tower in the village, you’ll know you’ve found Il Castello della Regina Cornaro. In later years the great British poet Robert Browning and American writer Ernest Hemingway sojourned in Asolo, as did British writer Freya Stark more recently. 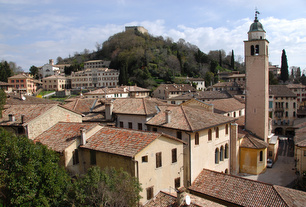 Stark credited the village of Asolo for inspiring her and she was buried in the local cemetery upon her death in 1993. As you walk through Asolo be sure to watch for Robert Browning Street, Robert Browning House, and Freya Stark house. One of the main features of Asolo’s main square, the Piazza Garibaldi, is the Palazzo della Ragione, on which you can still see the remains of ancient frescoes dating to 1588. The ground floor Loggia was the seat of justice during the Venetian period. The Museo Civico (Town Museum) is actually housed in the Palazzo and boasts an impressive collection with paintings by notable Renaissance artists and archaeological displays. Adjacent to the Palazzo della Ragione is the Asolo Cathedral. Take the time to visit inside, where you’ll find paintings that date back to the 1400s and 1500s, including work by the renowned painter Lorenzo Lotto. There are other villas, gardens, and cathedrals to see, as well as the Fontanella Zen (Small Zen Fountain) that was placed here in 1572. Not to be missed of course is the mighty polygon-shaped fortress at the summit of Mount Ricco in the center of Asolo. Experts believe construction of this irregularly shaped fortress began in the 12th Century and continued into the 13th Century. From the buttresses of Asolo’s fortress you will see why many call Asolo the village of a thousand horizons. From this lofty view you can enjoy a 360° of the surrounding verdant green countryside. Other stops on the Small Group Hill Towns of Veneto Trip include visiting an example of a grand Palladian country house, usually either Villa Barbaro or Villa Emo although availability and visiting hours can be somewhat variable because the villas are privately owned. Both offer exquisite examples of Italian frescoes and other hallmarks of designer Andrea Palladio. After a full day exploring and soaking in Italian history and culture, the last stop is a casual wine tasting at a regional winery. The Glera grapes grown on the carefully terraced slopes here are used to make the sparkling white Prosecco wine. Trust your vacation experiences in Italy to the tour specialists at Avventure Bellissime. Contact us now to help you plan an Italian vacation.